For those who didn’t grow up on a farm or ranch, many of us still long to be cowboys or cowgirls, own our own horses and somehow participate in the country western lifestyle so happily portrayed in countless movies and television series. And that desire is at the heart of IGRA and its members. While the rodeo is absolutely competitive at every level, still, there’s a welcoming, easy camaraderie at a rodeo. But one of the big surprises is that not everyone owns a horse, not everyone competes. Many people attracted to the country-western lifestyle aren’t necessarily interested in riding. Lots of people start by volunteering to sell tickets or working as security, and they quickly become hooked on the warmth, friendliness and acceptance they experience. IGRA is a unique sport because it has so many different things going on at the same time; there are volunteer spots to fit anybody’s interest and chosen level of involvement. In fact Doug Graff, IGRA president in 2011-2012 calls himself “a big ole’ sissy.” He’s done some rough stock and camp activities over the years but now spends time as a funny rodeo clown (not a bull rider clown) and as an announcer. He loves IGRA because he says it doesn’t require him to portray the macho stereotype most people associate with rough and tumble rodeo to be part of it – he loves it because, as he says, “there’s a place for people like me.” No matter who you are, you know you belong – you really are family. 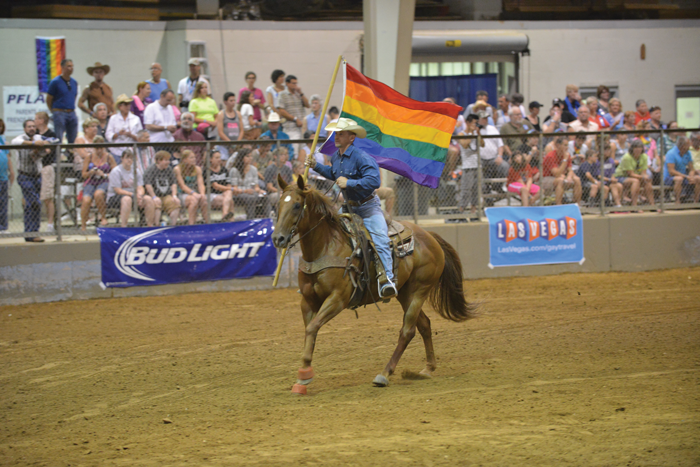 With its beginnings at the 1976 National Reno Gay Rodeo in Nevada, IGRA’s mission is to support the various rodeo associations that support their communities. And IGRA does that by providing its member associations with the necessary tools to produce quality events, by positively promoting the LGBTQ country western lifestyle and by supporting amateur sportsmanship through participation, competition and recognition. For the many people who belong to IGRA and its many state-wide associations and local chapters, it’s the fun and exhilaration of meeting new people and making new friends who are equally devoted to maintaining the country western lifestyle through rodeo events as well as educating and training new people so they can compete in the various events. They also sponsor lots of social events that include trail rides, country music, dancing, going to horse shows and any other type of horse-related events.